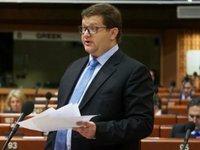 Verkhovna Rada of Ukraine deputy (Petro Poroshenko Bloc) and head of Ukraine's delegation to the Parliamentary Assembly of the Council of Europe (PACE) Volodymyr Ariev has responded to being put in the Russian sanctions list. "Ok, so there's a list. Do they really think putting my name on it matters to me? I don't have a ruble. I have no property in Russia or business there. I haven't been allowed to travel to Mordor since 2008. Again, Russia is acting like a fool, just like when the Russian State Duma said Ukraine is an aggressor state. They are crazy. Nothing they do surprises me anymore," Ariev said on Facebook on Thursday.